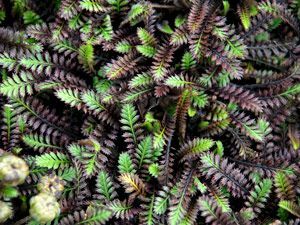 Miniature leaves of dark bronze and green have a fern-like appearance and form a mat soft enough for a fairy to nap on. 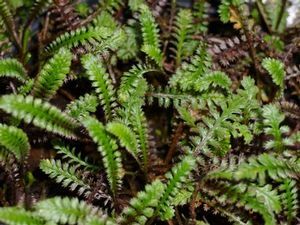 At only 2” in height the tiny leaves are ideal for filling in cracks and crevices, between stones, in a rock garden, or as a grass substitute for a small area of lawn. Tiny yellow flowers are produced in spring. Provide afternoon shade and average moisture. Water regularly during the first growing season to establish an extensive root system. Remove old foliage (dead-head) before new leaves emerge. Divide clumps every 2 to 3 years in early spring.